Some truly scary stuff is going on here. They're talking about canceling trick or treating because of a weather front that is moving in today with high winds. A cold front with strong, gusty winds, they're warning. Come on kids. Tough it out if you really want the candy. Also, making my day is a selfie shot sent by my daughter Grace. That's sure to shock anyone. I texted her back and said, "I told you to dump that guy!" 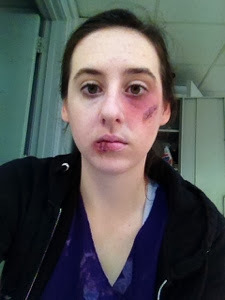 But luckily, I'm joking and I know that she is in her stage makeup class doing her best to look bruised and battered. Does anyone remember the David Sedaris story where his sister Amy goes to have her picture taken for a magazine story about New York women? Amy asked to look like a battered woman? Love David Sedaris. Here's the story. Hope Grace remembers to take off that makeup before heading to her next class. The point of National Novel Writing Month is for me to avoid finishing the edits on my other novels. Oh, wait. That's not the point. Hundreds of thousands of authors and would-be authors join Nanowrimo in an attempt to write 50,000 words of a novel. Fifty thousand words does not quite equal a novel, but it's a good chunk of one. My last novel was about 80,000. The one that will hopefully be published in November is over 100,000 words. Since my first novel The Summer of France was set in France. And my soon-to-be-published novel, I See London, I See France, is also set partially in France, I decided to focus on a novel that is set right here in Columbus. When was the last time 34-year-old Maeve left her apartment? She can't really remember. Maybe six weeks earlier for a haircut. She works from home, has a treadmill in the corner of her Columbus apartment, and Amazon plus Green Bean delivery bring everything she needs to her door. But this wasn't how it was supposed to turn out. Maeve sets out to turn her life around with Feng Shui and a search for her childhood friends who knew the real her. Nanowrimo has this weird thing where it asks the author to give a synopsis of the novel and an excerpt plus a book cover. How is all of this possible for people who haven't begun their novels yet? Luckily, I'm about 25,000 words into my novel. If I write 50,000 words in November, I'll have 75,000 word and I'll be close to a finished novel. Don't worry. I'm not quitting my day job to do book covers. And, here's an excerpt from my 25,000 already written words. Pausing at the window, Maeve realized how glorious the leaves looked from her second story view and suddenly, she wanted to get out there to experience it. She hadn’t felt that way… well, she couldn’t remember when she’d felt that way. Before Joe had broken up with her? Before she’d met Joe? Enthusiasm seemed to have drained from her life sometime between childhood and this 34th year she found herself in. “This must be the enthusiasm gap the politicians are always talking about,” Maeve thought to herself then smiled. Had it been during her college years that she became blasé about everything? She had hung out with a lot of hipsters whose main goal had been to try new things only to dismiss them. Maybe she’d embraced that philosophy too much. She’d taken it to the point where she really did stop feeling joy at the taste of chocolate melting on her tongue or a fresh breeze blowing against her cheeks. “Today is the first day… Wait. I’m not ready to go there,” Maeve said aloud to her bedroom. NaNoWriMo asks authors to choose their genre. I definitely consider this novel Women's Fiction, but I don't have that choice on NaNoWriMo. I could choose Chick Lit, which of course is dismissed out of hand by many people, or I could choose Mainstream Fiction. I chose Mainstream Fiction. So, starting Friday, I'm off to see how many words I can add to my novel. I'll keep you updated on my journey. I'd love it if any other authors would friend me on Nanowrimo so we can cheer each other on. 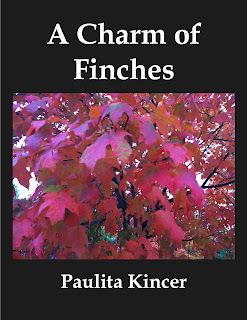 You'll find me at Paulita Kincer. offered to send out a hard copy to either a North American or UK reader, along with an ecopy. 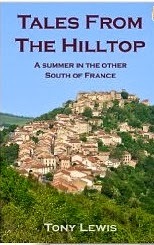 Dixon's book is set in Medieval England and France. It includes a great attention to detail and some intriguing characters that you'll cheer for while rooting against those Medieval bad guys. See my full review here. Leave a comment and make sure I know how to reach you if you want to be registered. I'll draw a winner next Wednesday, Nov. 6. This is one of those weeks that I wish I had more time to spend curled up in a chair on the front porch with a book. I have more time, since three of my classes finished, but a new one is starting and I have a list of things to do that I've put off. But here's a book that I have snuck a bit of so far. Someone online recommended it to me, but I can't remember where or when. 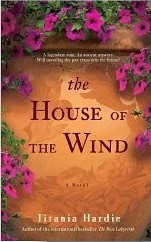 The House of the Wind by Titania Hardie is about a woman who is heartbroken after her fiance dies, so her grandfather sned her to Tuscany to heal. Who couldn't heal in Tuscany? 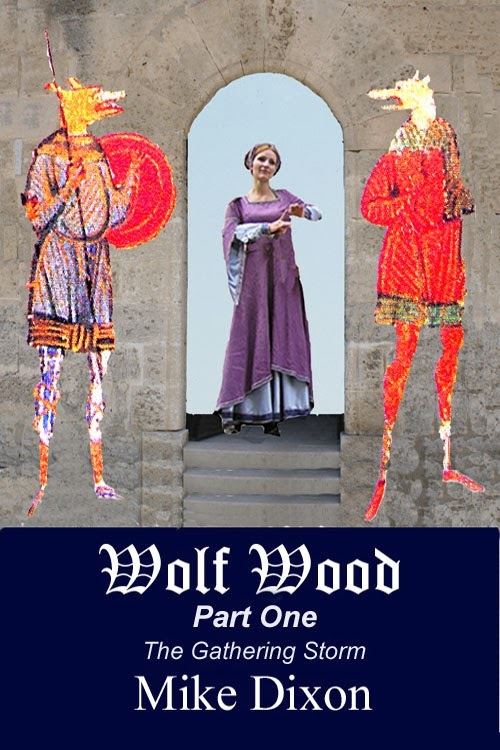 The story is interwoven with one from 1347 in the same area of Tuscany. In the calendar of seasons and times, January is Janus-headed: the patron month of gateways and doors, of looking forward and backward. Back over what has been, what brings us to this point; ahead to what may be, anticipating the dreams of future days. Perhaps today, laughing and circling the date on her calendar with a bright pen, Madeline Moretti had given some thought to this, at least unconsciously. She'd certainly been revising in her mind Christopher's favorite foods -- his preference for salads and seafood, his enjoyment of full-bodied red wines more than champagne, his very British love of crumpets (accompanied with quince jelly!) instead of croissants, his funny thing for rose Turkish delight and dates dipped in dark melted chocolate -- so that when she opened the cupboard tomorrow on his first morning in San Francisco she would be able to supply his most eccentric wish effortlessly, with dainties that had been shipped in anywhere from Maine to the Napa Valley, from London to Provence, "from silken Samarcand to cedar'd Lebanon." The captain raced on in his speech. "We thought the girl had been killed, crushed by the fallen masonry, along with her parents and the guards. 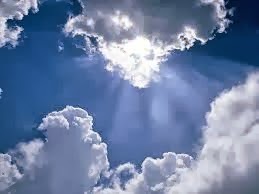 But," he said, breathing in deeply, "after the weather let up we began to clear away much of the rubble, and while all other bodies have been recovered, she appears to have vanished. There is no trace of her. It is witchcraft!" 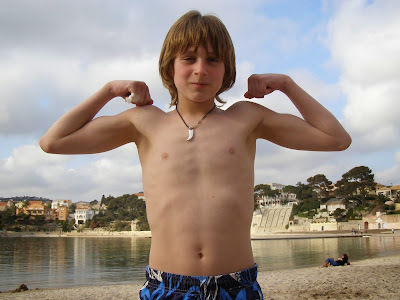 In honor of my son Spencer's birthday, I thought I'd include a photo of him on the beach in Bandol when he was 12. The kids were too young to enjoy the nightlife, but they all still talk about what fun they had in Bandol along the Mediterranean. The city is a perfect place to explore the Camargue, Aix en Provence and all the other cities of Provence and the Riviera. 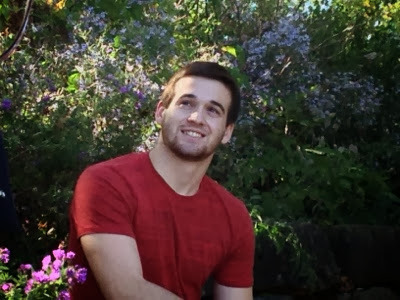 This week, my oldest son, my second child, turns 20. 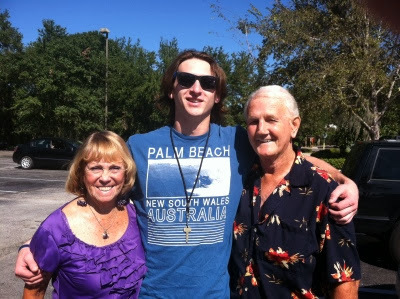 I won't get to be with him, so that makes me a little sad, but luckily his father has flown down to Florida so they'll get to spend some time together for his birthday. From the minute Spencer arrived, two weeks early, he has been curious. 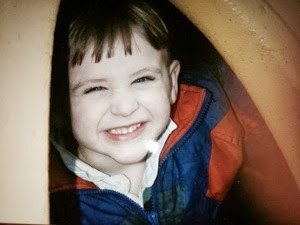 As a toddler, as a kid, as a teenager. I hope he never loses that. 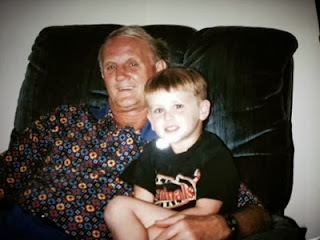 Recalling Spencer as a little guy, I can hear the echo of his footsteps as he made the early morning dash from his bedroom, across the wood-floor landing toward our bed before he dived in between me and Earl. We teased him when he was little that he should wear the box instead of the shoe because his feet were so square, as wide as they were long. Thud, thud, thud, his feet would race across the landing. When he was very young, Earl started a thing with him. If Spencer pressed Earl's nose, Earl would beep. One morning early, Spencer pressed on Earl's nose. Earl was too tired to respond. Spencer pressed again. Still nothing. "Hmmm," Spencer said. "Must need new batteries." He loved castles and knights, plus swords and armor. He wanted to fight dragons and bad guys. He's always loved sports and grew from a chunky little boy to a wiry school kid (even though he homeschooled). He practiced basketball until he injured the growth plate in his elbow. He played quarterback in 6th grade football because he was the only one who could memorize the plays. 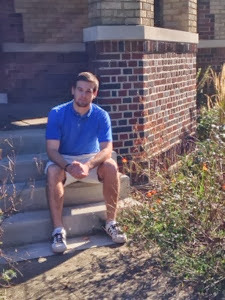 He decided he wanted to go to real school in eighth grade, so we moved to a small town where we could enroll the kids. Grace started school then too, and Tucker followed six months later. 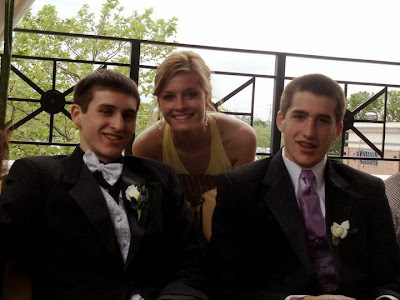 He's always loved being with friends, more than my other kids. 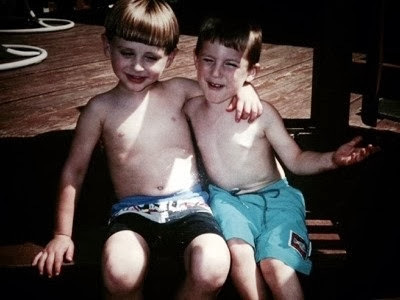 Even the pictures of him as a little boy show him with an arm thrown around another guy's shoulders. Even today, his buddies come first. He had some tough times trying to figure out who he is and what he stands for as a teenager, but as he turns 20, I hope he's more sure about himself and his abilities. He knows he loves nature and plans a career as an environmental scientist. He takes a kayak out on Tampa Bay and paddles to islands covered by mangroves before leaning back and sleeping in the sunshine. So he's far away in the sunshine this weekend, taking a couple of days to spend with his dad and his grandparents (my parents), doing his laundry and eating homemade meals (steak was his first request). Also helping to paint their house because he remains a generous guy who doesn't mind helping out, even on his birthday. I can't wait to see what you accomplish in the next 20 years. I haven't played along with Saturday Snapshot for a while now, but this morning I saw something I thought I would share as a photo. Our neighbor's son seems to frequently be the victim of pranks. Once his car was encased in plastic wrap. 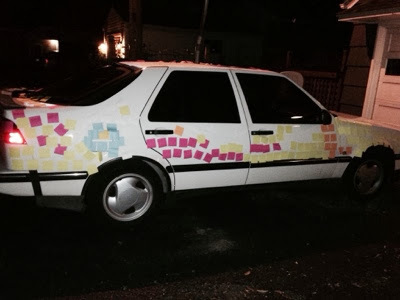 This morning his car was bombed with sticky notes. Not a bad prank, just time consuming to clean up. Hope he didn't have to get to the ACT test by 8 a.m. like Tucker did. Since I dream of someday moving to France, I love to read memoirs of other families' adventures as they settle into that beautiful country. 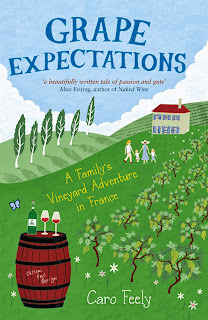 Few authors have written as honestly about the challenges of starting a new life in France as Caro Feely does in her book Grape Expectations. The memoir drew me in so I kept reading, sometimes just to get to the end in hopes that things would turn out better for her. I couldn't imagine trying to rehab a barely livable house while raising a baby and a preschooler and my husband spending every waking moment in the vineyard. The fence around the 3-metre-high terrace was rusted away, making it a deathtrap for children. The place was thoroughly rundown. I looked at the date 1737, etched above the cellar and thought 'Oh my God, what have we done?' then swallowed back a wave of tears and tried to concentrate on the view. The natural splendour of the valley sprawling below, decked out in the bright greens of summer, was breathtaking. 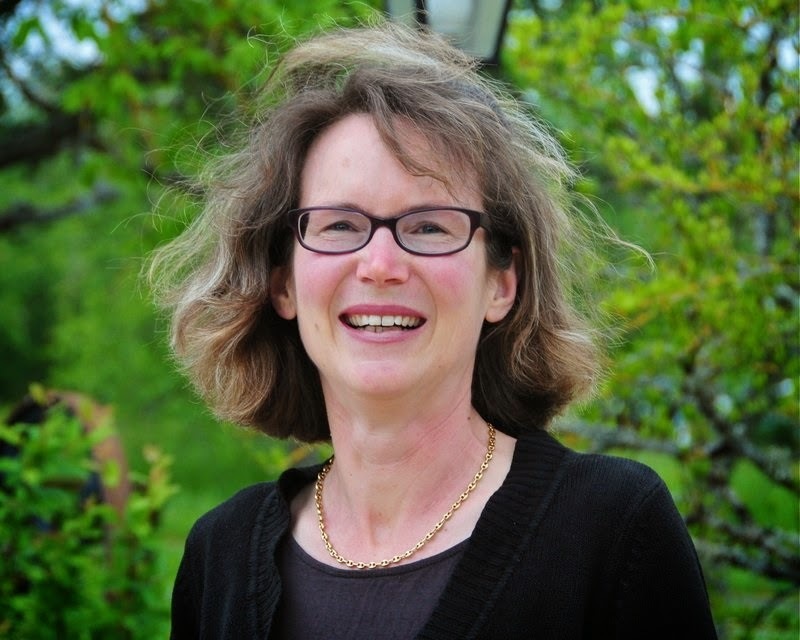 Feely pulls no punches as she relates the dire financial circumstances she and her family faced, along with the thoughts that the winery would pull her marriage apart. I enjoyed this book and rooted for Feely and her family throughout. Sometimes the book went into much more detail than I needed about how to make wine and how to farm grapes. But I think some people, like my husband, would enjoy those details, so I've recommended that he read it. One plodding section of the book went into details about biodynamics, which is extra organic. 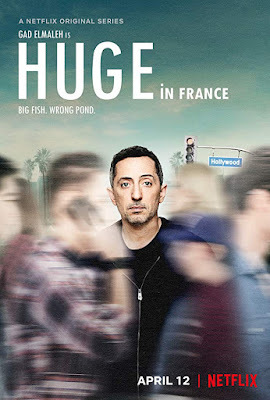 It's an interesting idea, but again too much detail for someone like me who wanted to hear about the experience of living in France. A side effect of reading this book was the yearning for wine. I really wanted to drink a lot of wine while I was reading it, no matter the time of day. I also looked up the specific wine that Caro and her husband are creating, and I'd love to visit their vineyard one day to stay in their guest house or take a wine class, so in that way, the book is definitely a success too. One of my favorite quotes from the book, is actually a quote from Galileo who said, "Wine is sunlight held together by water." That's a beautiful image and encourages me to raise a glass in toast to both Galileo and Caro Feely. I've been reading, but I haven't been blogging about my reading. 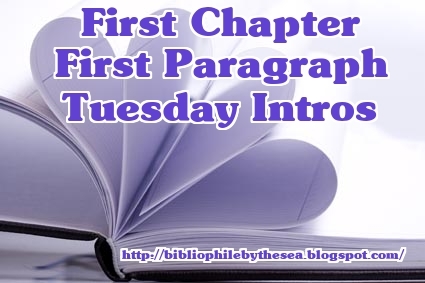 I thought I'd change that this week by playing along with First Chapter, First Paragraph. 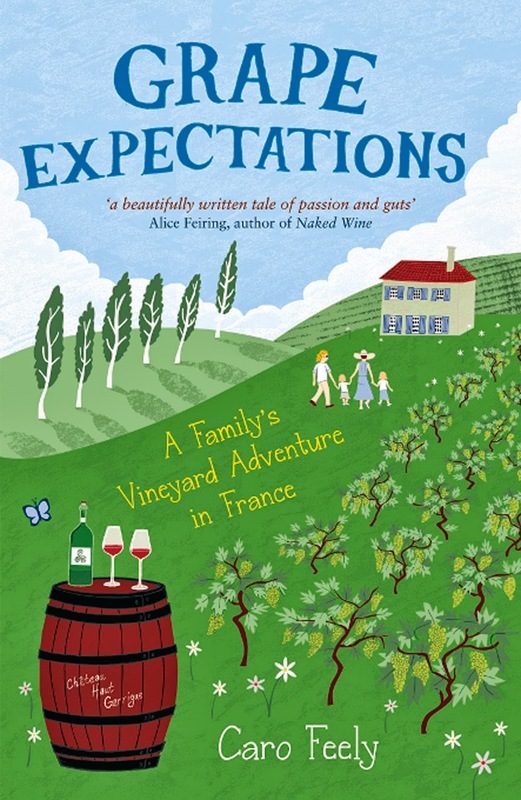 I read a memoir about a family moving to France -- this one with little kids and they bought a vineyard. Everyone's dream, right? 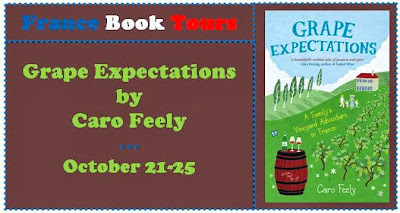 Wow, the author makes it sound a lot harder than anyone imagined in her book Grape Expectations by Caro Feely. "I think this wine is like an ageing dance. Her moves are slow and supple. Then she performs a pirouette just like she did when she was younger." Pierre-Jacques dipped the pipette into the wine-stained oak barrel, transferring tastes swiftly to our outstretched glasses. We stood in the entrance to his cellar, a cave hewn out of the chalky cliffs, captivated by the softening sun and his sensuous descriptions. The wine was smooth and serene across my tongue before fresh raspberries twirled at the finish. As you can tell, this book can teach you a lot about wine tasting, but it's also a fun read about a family too. I'll have a full review of the book on Friday as part of France Book Tours. I'm still fixated on beautiful fall photos from France. 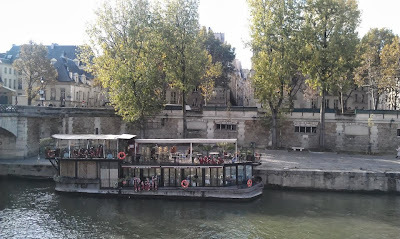 Here's one Grace took in 2011 along the Seine. Can't wait to see what you are dreaming of. Last week, All Things Considered on NPR, talked each day to people of different religions about the afterlife. The stories were called "What Comes Next? Conversations on the Afterlife." 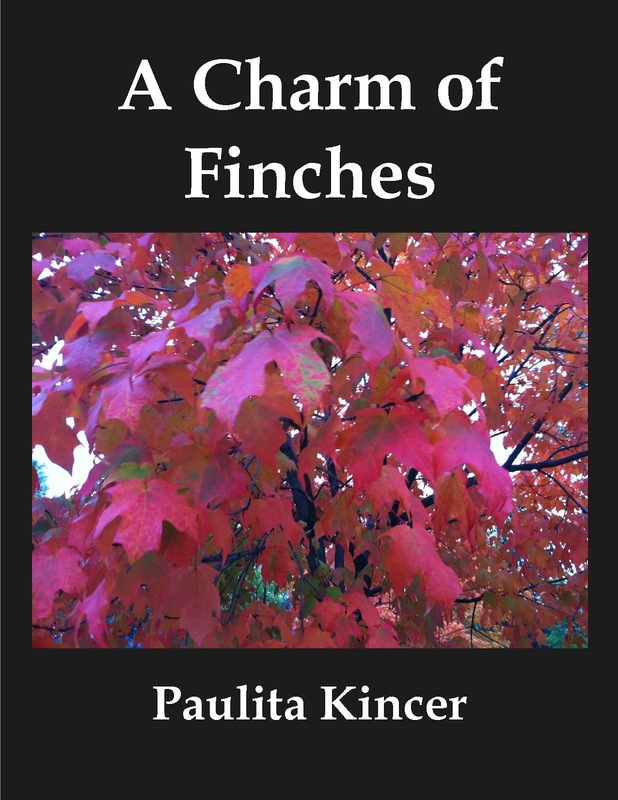 The link is to the story by the Catholic nun but along the side you'll see other stories too. I agreed with some of what I heard from the various religions and disagreed with some of what I heard from the various religions. But one thing kind of bugged me. One person said that whatever you want in paradise will be there, and that includes maids. I'm sorry, I do not want to be a maid in heaven and I can't imagine that there will be enough people whose dream is to be a maid to fulfill other's wishes in heaven. Right? I guess, I imagined either beds would make themselves, or we would be so far from sleeping and changing sheets, and making beds each morning, that it wouldn't be an issue. I don't want to be a car mechanic or even a cook in heaven. 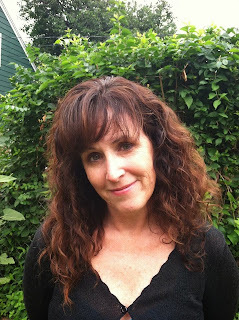 Can I be a writer in paradise? 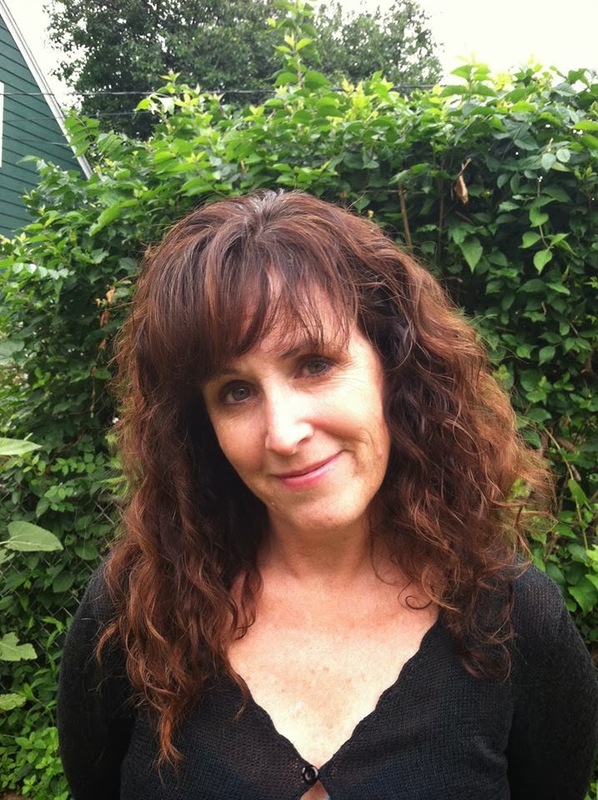 Maybe a writer whose every word is like manna from heaven. I'm still grading papers madly, with Oct. 26 as the end in sight that I'll get a reprieve for a bit, so I thought I'd post a short thought about spelling. Everyone knows that spelling isn't emphasized any more. As Alec Baldwin says in a commercial for Capital One, "Spelling, that's not a subject, that's an App, right?" Well, I was on the App store the other day searching for "Wait Wait Don't Tell Me!" the NPR news show. I figured it must have an app that I could listen to. As I typed in the letters, wai.... the app store began making suggestions of what I might be looking for. Unfortunately, the most popular search that begins wai... waight watchers. The autumn is really kicking in here. Some of our best trips to France have been in the fall, so the weather makes me long for France. 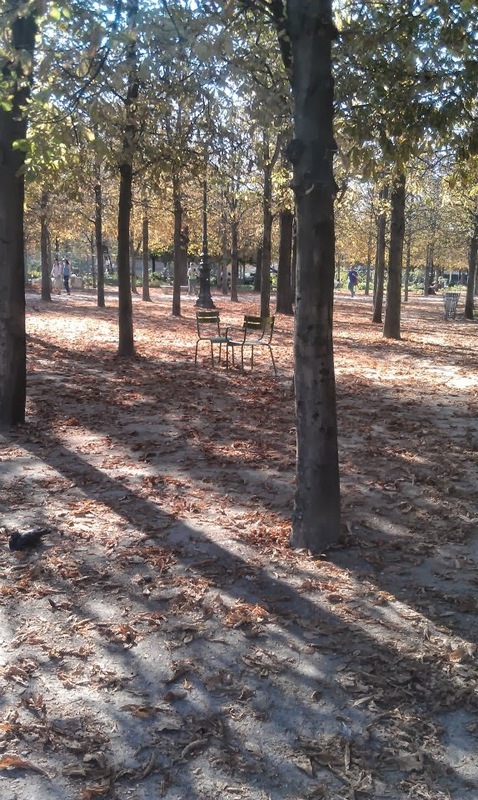 Look, some empty chairs are waiting there for us in the Jardins des Tuileries. That's it. Pumpkin products have "jumped the shark." I mean, there was a time when pumpkin could be bought in just a few forms, the whole pumpkin for jack o lantern carving or the pre-made pie. Sure, you could get pumpkin in a can to make your own pie or pumpkin bread, but then somewhere along the line the products exploded. I'll admit that a few weeks ago at Trader Joe's I did buy Grace some pumpkin spice coffee along with a box of pumpkin fruit and grain bars. I thought they were both rather exotic. The next week, Earl and I sampled the pumpkin risotto. That was tasty too. But when I went to Trader Joe's on Saturday, my senses exploded with pumpkin. The guy at the check out lane admitted they had about 16 new pumpkin products this week. 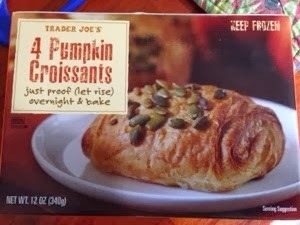 Yes, I did buy the pumpkin croissants, but only because Grace is home this weekend on mid-semester break. I found a blog post where the writer taste tested many pumpkin products from Trader Joe's last year and graphed them according to most pumpkin-y to least pumpkin-y. You can find her blog at Serious Eats. This year, she would have even more products to sample. I feel strongly that pumpkin has gone too far. Gotten too big for its britches, if you will. It's like the former pep squad member who is suddenly crowned homecoming queen. This can only end in disappointment. Meanwhile, the pumpkin croissants are rising on the stove and I'll let you know how those taste -- later. We spent Friday babysitting for our niece's daughters, 4-year-old Caroline and 1-year-old Regan. As Regan was eating her lunch, she choked on a couple pieces of avocado. It scared her as we pulled her from the high chair and banged her on the back so she could breathe again. She let out a wail as the avocado dislodged, and we knew she wasn't choked any more. But even though she could breathe, she was scared and wouldn't stop crying. 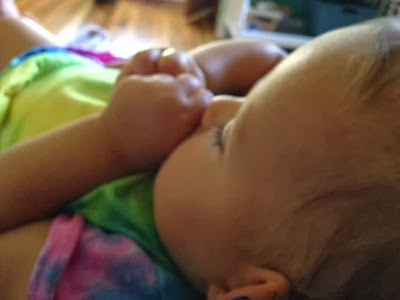 I finally rocked her to sleep, her lashes still clumped together with tears as she sucked on her thumb. Hope everyone is having a peaceful weekend. 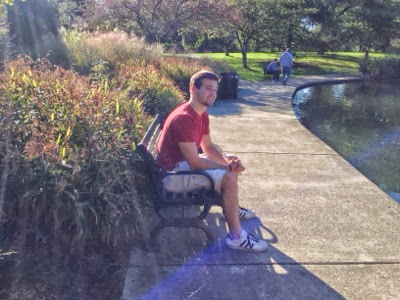 On a crisp Autumn afternoon, my youngest went to have his senior pictures taken. He went under protest. He didn't understand why senior pictures had to be a big deal. He just needed one picture. And, he needed some clean khaki shorts to wear, he warned as he headed back to school after lunch. Luckily, my husband had a load of laundry in the dryer, including a pair of khaki shorts. I'd taken Tucker to the store a few weeks before and encouraged him to buy a new shirt for senior pictures. "I'll just wear a shirt I have," he said and refused to pick out anything new. So after school, with our 4 o'clock appointment creeping closer, I asked what he planned to wear. A blue polo shirt, he said. A polo shirt is as close as Tucker gets to considering himself dressed up. And a blue polo shirt is fine, but it isn't what he would normally wear. 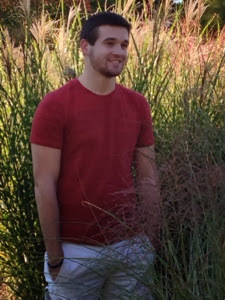 And I like a senior picture in clothes that the kids would usually wear. "Maybe we'll just take along another shirt to change in to," I suggested. "What? I'm not changing shirts. Where would I change?" "You are a guy. You can take your shirt off and put on another one," I explained to my son who is a swimmer and spends half his life in a tiny Speedo swimsuit. Then he put on his blue polo and I pointed out it was wrinkled. "I'll iron it," I said. "It doesn't need to be ironed. We need to go." I held out my hand for the blue shirt and took along a red shirt that has some dark striations through it. I thought it might look good in contrast to his dark hair and beard. And, yes, apparently the beard would stay for the picture. Sullen, would be the way I'd describe him, as we scrambled to get out the door to meet the photographer. But as soon as she met us, he became quite pleasant. I took pictures of her taking pictures of him. In both the red shirt and the blue shirt. In various places around the park. She thought the reddish grasses would go well with his red shirt. He warned me before we went that he was only doing close-lipped smiles. I told him we spent thousands of dollars on his teeth so he should be willing to show them. I tried to convince him that he should have different smiles and we'd pick the one that looked best. Spencer regrets that he "looks a little mean" in his pictures because he didn't smile, I told Tucker. And when he got there, Tucker did smile. I guess he just likes to argue about it with me. The photographer showed us a couple of shots that she got and I think we'll have plenty to choose from. Yes, they're all better than my phone shots in the background. 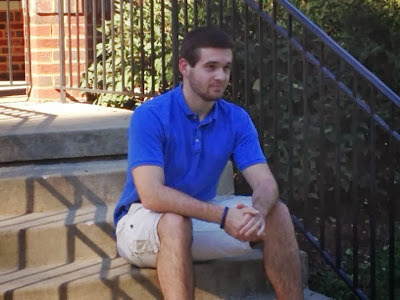 I noticed in the middle of the photography shoot that Tucker was wearing a bracelet. I don't know if it was a conscious decision to leave it on or if he just forgot it. I thought maybe he'd wear the watch he bought in Paris last year, but apparently that $100 expenditure has fallen out of popularity. The bracelet is one of those rubber ones, the kind Lance Armstrong made popular. This one is in support of a high school teacher and basketball coach who was just diagnosed with colon cancer before school started. So maybe it's okay that the bracelet is in his senior picture. Today for Dreaming of France, I'm going to share a couple of things to help you connect to France. 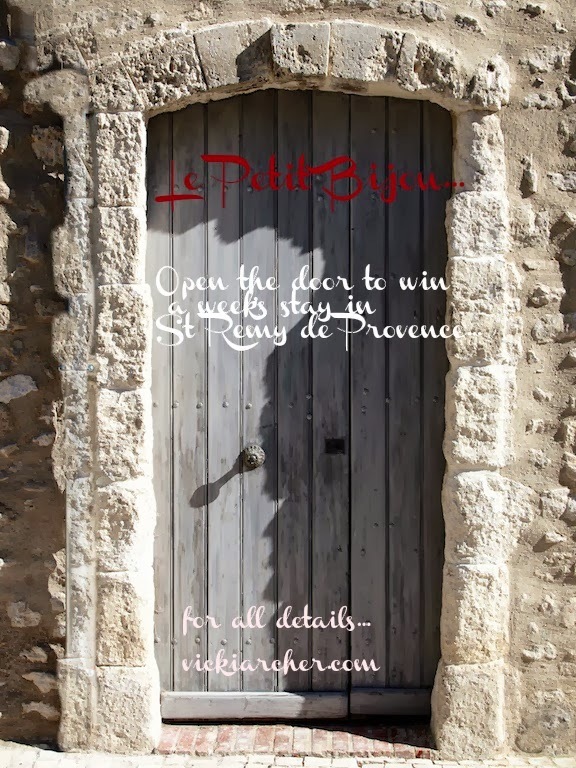 One is a contest to win a week at an apartment in St. Remy de Provence. 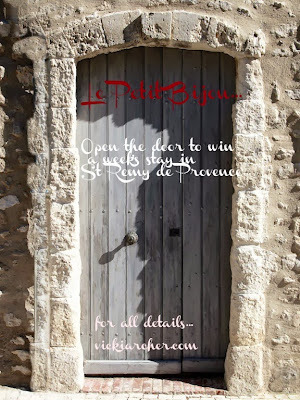 I know, who wouldn't want to win a week's stay in Provence? Just visit Vicki Archer's blog and enter to win. The contest is through Oct. 8, so it's almost over. Vicki is celebrating the fifth anniversary of her website and the completion of her rental renovation. I'd love to wander around Provence and return to this little jewel. And that is what she calls it, Le Petiti Bijou. Make sure you take the time to look at the pictures to see how she has decorated this quaint rental cottage. 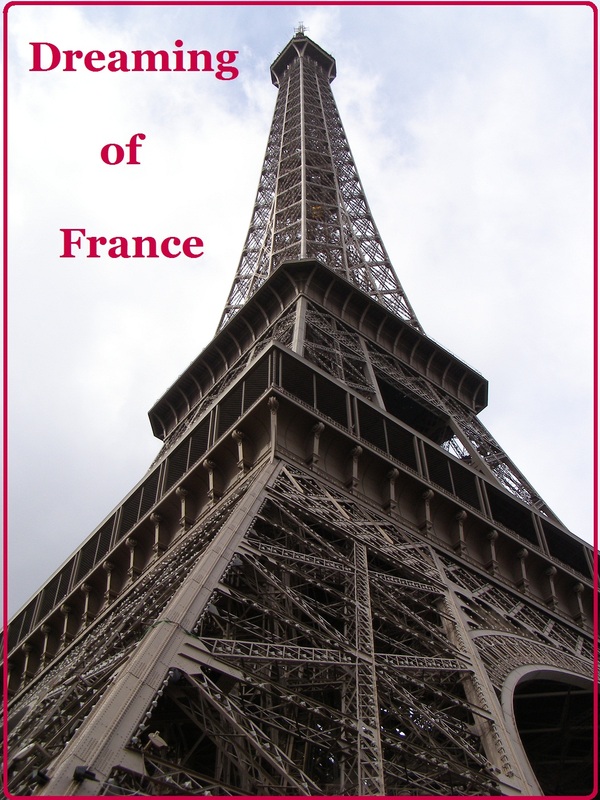 Another freebie to take you to France, but only in books this time, is a free Kindle travel memoir on Amazon. I'm always trying new books about people moving to France. This one is called Tales from the Hilltop by Tony Lewis. It was free on Sunday, and I hope Monday too. If you don't get it free, I'll read it and let you know if you should read it. And, one more free book, at least it was on Sunday -- The Bleiberg Project. I can't tell if this book is set in France or not. It's a thriller and the blurb says it was an instant success in France. It is based on a conspiracy and the beginning of the blurb asks, "Are Hitler's atrocities really over?" The main character is a Wall Street trader who learns his family may be connected to the conspiracy. Thanks for playing along today. I'm looking forward to going wherever your books or movies or photos take me too. My darling daughter texted me excitedly earlier in the week from her stage makeup class. "We have to age ourselves so I used a picture of you as an example." People say Grace and I look alike, except she's 6 inches taller than I am and has straight hair. It makes sense that if she wanted to age herself, she would look at a picture of me. She downloaded my picture from Facebook to use as a guide then she set out to make herself look old. "Everyone who saw your picture said you were so pretty," Grace said. But when she texted the photo of herself looking older, I didn't feel flattered any more. I hope Grace ages better than me, or at least better than the makeup she used to age herself. 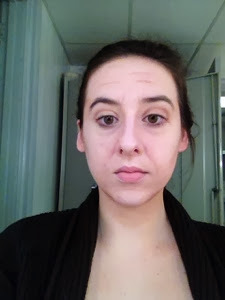 She sent another picture during her makeup test that doesn't look quite as frightening. Here's the picture with her looking "middle aged" on one side of her face and in "old age" on the other side of her face. Who would make themselves look intentionally old anyway? You'd think, with my third kid, I'd be better at college visits, but here it is October and we are only on our 2nd visit. And he is a senior. He has to apply by the end of November. 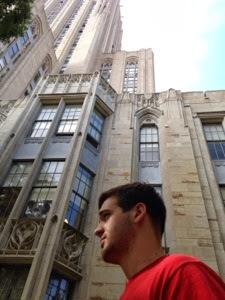 Today we went to Pitt, University of Pittsburgh, about 3 hours from home. It's a gorgeous day, weather in the low 70s, sunny. Pittsburgh is built on a series of hills with some of the trees turning vibrant orange already. The campus is smack-dab in the middle of the city. I liked the urban feel. Cool architecture. 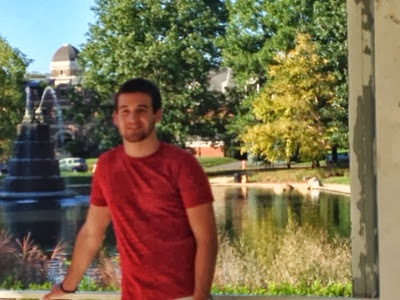 Although the campus is big, 18,000 students, it feels fairly compact and sort of magical. Of course, the college campus near our house has 50,000 students, so everything seems small in comparison. 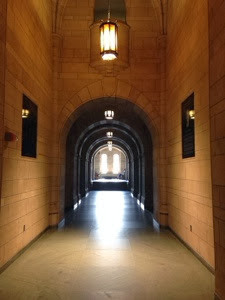 The cathedral of learning felt like Hogwarts. 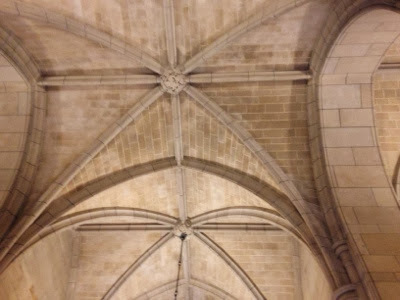 And the ceilings looked like a cathedral too. We ate in a great little diner right downtown. Tucker wants a big campus but isn't sure he wants to be in a big city. That's a tough request. Any suggestions?